BBL Photo Rejuvenation (photofacial) at Refine MD in Menasha, Wisconsin: Have Luminous Younger Looking Skin. We can help you rejuvenate and revitalize your skin. Our treatment program can help improve a variety of conditions. BBL (BroadBand Light) Photo Rejuvenation is a noninvasive treatment requiring little to no downtime that produces luminous, younger looking skin. BBL Photo Rejuvenation (Photofacial) delivers Intense Pulse Light (IPL) energy through the skin’s surface to treat age spots, sun-induced freckles, symptoms of rosacea, unsightly facial veins and other blemishes. This treatment is ideal for patients with an active lifestyle because the procedure requires no downtime, and has a low risk of side effects. Treating tanned or darker skin types requires special consideration. If you’re considering a treatment and are interested in learning more about BBL Photo Rejuvenation please schedule a free consultation by calling us at Refine MD: 920-380-9990. BBL Photo Rejuvenation is a noninvasive treatment that reduces pigmentation problems such as age spots, sun spots, enlarged pores and broken capillaries, leaving you with a clearer, more even skin tone and complexion. Where can BBL Photo Rejuvenation (PhotoFacials) be used? The most common areas treated are the face, neck, arms, décolleté and hands; however, these treatments can be used anywhere on the body. Once the treatment is ready, a full face treatment can be completed in 15-20 minutes, although time varies depending upon the area being treated. Results can be seen after just one treatment, although four to six treatments at two week intervals is typical in order to receive optimal results. Side effects may include slight redness (most patients return to natural skin color within 20-30 minutes). Pigmentary changes of the skin, blisters and red spots are rare but occasionally occur. You should not have BBL Photo Rejuvenation treatment if you have been recently tanning or if you are skin type IV or V (darker skin types). 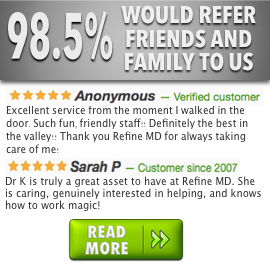 How much does a Photofacial cost at Refine MD in Menasha, Wisconsin? The cost varies depending upon the body part being treated. Please contact us for specific pricing.